Time is the great revelator -- it uncovers everything, eventually. One of the more profound ironies to have emerged from the 1989 Tiananmen Square massacre is the enduring image of the "unknown rebel" halting a procession of tanks with nothing more than a couple of shopping bags in his hands. The fact that "tank man," as some call him, will forever live alongside the benevolent visage of Mao Tse-Tung as symbols of China in the twentieth century is something to truly relish 17 years on from June 4, 1989. While tank man wasn't able to stop the killings (warning: graphic photo) that had already occurred -- not only in the vicinity of Tiananmen, but all around Beijing -- he was able to single handedly overturn perceptions. By doing so, he created a legacy extending far beyond the bloody culmination of those horrific events. In China, as in much of Asia, standing out from the crowd is rarely seen as a virtue worth emulating. Many have no choice but to abide by the oft-quoted proverb "the nail that sticks up gets hammered down." But tank man's singular defiance offered a potent alternative. For one brief moment he smashed all the cliches and inadvertently fashioned an image more powerful than the state's machinery. Tank man ultimately became the nail that broke the hammer. While he never really disappeared, at least outside of China, to this day his fate remains a mystery. Indeed, for some within mainland China, he is largely an unknown figure due to the excessive control the state exercises over the media. The sudden impulse that moved tank man to respond is a familiar one. It resonates through every culture, voicing itself in simple acts of spontaneous fortitude embodied by figures such as Rosa Parks, who refused to rise from a bus seat because she suddenly felt "tired of giving in." The poet William Blake called this impulse the "voice of honest indignation...the voice of God." For Blake, the human form was divine, but there was nothing mystical about his God; he celebrated it everywhere and especially in the seemingly small, but profound actions of his fellow beings. I suspect this is what propelled Wang into the fray -- a feeling rising from the gut, as immediate and undeniable as a nail breaking through a surface. And like some enigmatic cynosure, his action compels our attention. We still respond to its power because we know innately it is the essence of our shared humanity -- we yearn to be associated with something larger than ourselves. As Martin Luther King Jr. once wrote from a Birmingham jail, "Injustice anywhere is a threat to justice everywhere." However, today this struggle has been co-opted by governments around the world. Like many American coups, the Bush administration has used it as its modus operandi for invading Iraq. In the context of the "war on terror," standing up against injustice has been perverted into a justification for state sponsored lawlessness. Similarly in China, the image of tank man has been used by the authorities to suggest that a massacre never occurred, that the government actually respects the rights of their people to peacefully demonstrate. 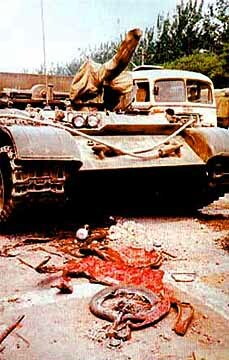 "Look," they say, "he was not crushed by the tanks. We stopped and listened to what he said." Needless to say, few accept this facile explanation. The Chinese courts also appear to be finally losing patience. This past April, Tang Deying, a mother of a 15-year-old boy who lost his life in the aftermath of June 4, was awarded $8,745 in "hardship assistance." While not officially "compensation," it could signal more changes in future. I live in Hong Kong, and unfortunately the idealism represented by the students who organized the Tiananmen protests is considered more Hallmark card sentiment than a civic duty, and its ramifications are too often dismissed. Ironic perhaps for a "People's Republic," but China long ago traded in any such idealism for more practical considerations, like censoring the Internet. Nevertheless, the Tiananmen Square massacre, or "incident" as Mainland authorities refer to it, still resonates very deeply here. In the aftermath of the killings, people who could leave did so in droves, securing dual citizenship and sending their children away to Commonwealth countries like the U.K., Canada or Australia. People were terrified of the prospect that the Communist Party would be taking over Hong Kong in 1997. Some eventually returned and to this day, the territory remains the only location in all of China where every June 4 candlelight vigils are officially permitted. Last June, 40,000 attended and this weekend another is planned. As I witnessed events unfold across my TV screen, I shared the students' hope for a better future. Growing up in Canada, I was raised to value that sense of idealism. My home resonated with music, especially my mum's union songs and her favorite, "Joe Hill," about the IWW organizer who "never died." A staunch unionist to this day, mum taught me to appreciate the old Wobbly slogan "an injury to one is an injury to all" from the time I could crawl a picket line. As an oddball kid, I stood out -- rather than the Iron Maiden or Slayer tees my peers wore, I'd show up at school in a "Sandanista" T-shirt. The first novel I remember caring about was John Steinbeck's "The Grapes of Wrath" and I had all the words to Woody Guthrie's "Tom Joad" memorized by the time I was 15. 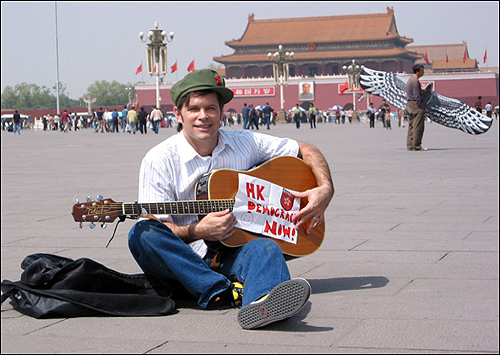 So, when Yuko, my wife, and I took a trip to Beijing I packed along my guitar. We checked into our hotel about a kilometer from Tiananmen Square and set out to take in the sights. 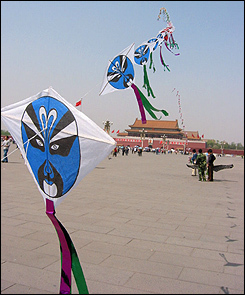 While we were flying kites under blues skies in the humongous open space of the square, my eyes began scouring the area for any dangerous looking People's Liberation Army (PLA) soldiers. I had a plan, something I felt compelled to do. After deciding the coast looked clear, I gave Yuko the sign and lay my guitar in its soft case on the concrete of the square. Yuko took out our camera and got ready to shoot. As anyone who has spent some time in China will know, a crowd is never very difficult to conjure. As soon as my guitar appeared people began to gather. I hit a chord, and stopped. I was nervous, and a little frightened. How would this busking event be interpreted? Would I be blind-sided by some PLA thug? Bundled up and thrown into a black police van, never to be seen again? I adjusted my harmonica holder, stood up and began to belt out -- what else -- Bob Dylan's "The Times They Are A-Changing." The crowd got larger and I started another, one of my own, "Peaceful Son." Yuko was clicking away, recording this guerilla folk spectacle for posterity. Then I finished. Applause and smiles followed, a few appreciative words of broken English and that was it. No soldiers, no thugs, no arrests. The crowd melted back into the square and the picnic-like atmosphere resumed. I then pulled out my homemade petition -- "Hong Kong Democracy Now" -- while Yuko snapped the last photo, making sure to include Mao's benevolent visage hovering in background. After all those years, tank man had pulled me into the fray. To quote MLK again, "We are caught in an inescapable network of mutuality, tied in a single garment of destiny. Whatever affects one directly, affects all indirectly." On June 4, the anniversary of the day the Chinese government tried to crush the spirit of its people, the legacy of tank man lives on. Let those who perished remind us of our mutuality, our single destiny.